The indigenous knowledge systems of traditional Africa have many uses for the marula tree. The most common are the preparation of a potent marula cider from the fruit; adding the seeds to porridge and meat dishes, as well as a variety of domestic uses including skin softening oil, a general antiseptic made from the leaves, and red-brown dye and tanning fluid decoction from the bark. Preliminary laboratory tests show weak pharmalogical activity relative to hypertension, anti-inflammation and painkilling. Modern commercial usages include the production of a delicious fruit jelly, chutneys and konfyt from pulp and peel, liqueurs and commercial beers, massage oil, skin creams, lotions, soaps and candles. 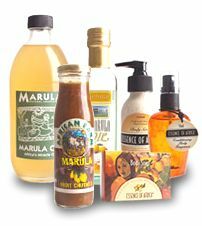 MNP is fully committed to developing new usages for marula fruit and welcomes enquiries for further product applications. Exciting opportunities exist for both donor funding of extension work and development projects, and commercial investment partnerships in research into of new marula products and processes. Collaboration is also sought with companies who have expertise in the commercialisation of novel and active cosmetic ingredients and/or food and beverage development. Contact mnp@lantic.net regarding opportunities to grow with MNP (Pty) Ltd.